Sixth Grade Spaghetti Dinner is Tonight! The Sixth Grade Spaghetti Dinner takes place tonight from 5:00-7:30 p.m. in the Parish Hall! We look forward to seeing our BES families, alumni, students, and friends there to support our sixth grade and to enjoy a joy-filled Italian dinner! 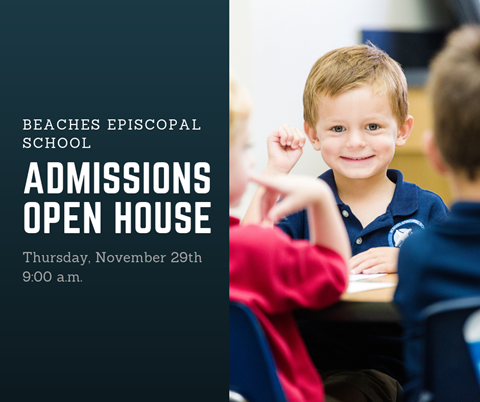 If you know of a neighbor or family member that is looking for an independent school with over 65 years of academic excellence and a loving, Christian environment, please let them know that we would enjoy getting to meet them at an Admissions Open House on Thursday, November 29th at 9:00 a.m.
We hope you're already considering registering other family members for the 2019-2020 school year. We are currently accepting applications and due to high volume of early applications, we have only a few spots remaining in our PreK3 and PreK4 classes. At the time of this newsletter's publication, we have received donations totaling over $44,000 toward our $65,000 goal. Thank you to all of our families who have already given to the Starfish Fund. Below is a breakdown of parent giving percentages by homebase classroom up to this point in the campaign. Remember that all classes who reach 100% parent participation will receive a FREE DRESS DOWN DAY! Thank you in advance for your generosity. Ever wonder why Beaches Episcopal School has an annual fund? Watch this new "Why Does BES Have an Annual Fund?" video to learn more about how your gifts to the Starfish Fund make a significant impact on our school community. By making a gift every year, in any amount, you build upon our legacy of academic excellence and directly impact the success of our students. 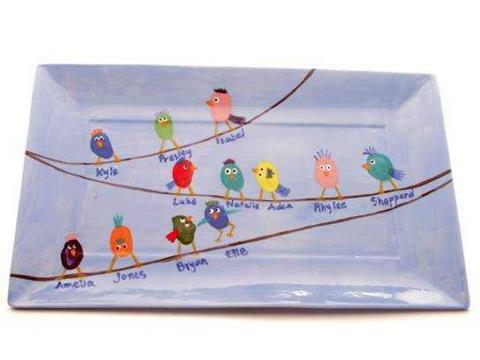 We are thrilled to announce that our PSO (Parent Support Organization) Fall Pottery Fundraiser has begun and will continue through Friday, November 9th at 2:30 p.m. This year, we are excited about our fun Easter/Spring theme! Each class has shared their artistic talents by creating these sweet, beautiful platters, and Mrs. Henson, the school's art teacher, has been a tremendous help along the way. These are special keepsakes that you will enjoy forever! We hope your students are planning on joining us for another exciting session of After-school Activities set to begin on the week of Monday, November 26th. Please email Midge Lilly to sign up now for an activity! Below is a list of available offerings for Session #2. Need piano lessons? Email Judy Larson. Go to the After-school Activities page of our website to learn more about each offer and view flyers with dates and costs. Some activities may be billed to your FACTS account and others may require a check to the teacher. Please refer to the specific activity flyer for more details. Register Your Students for Flag Football and Volleyball Teams Now! Practice days are TBD. Practices will begin the week of January 7th. Games will begin the week of January 21st. Games for JV will take place on Monday, Varsity on Tuesday, and Volleyball on Thursday. Our BES cheerleaders will be visiting residents and sharing their talents at the Avanté Nursing Home in Jacksonville Beach on November 15th at 4:15 p.m. These girls love to make a difference in the lives of those in our community, and this outreach accomplishes that purpose. Also, parents are encouraged to attend a pep rally on Friday, November 9th after Flag Ceremony for a special presentation from the cheer squad. We thank BES parent, Mindy Starkey, for her leadership of the team this year. Way to go, Rays! Join us for Incredible Edibles on Saturday, November 17th from 8 a.m. until 2 p.m. at SPBTS. Frozen soups and casseroles, homemade delights of baked and canned goods, crafts, gifts, and treasures are available for purchase. Gift baskets and auction items will be available, as well as a French Cafe serving coffee and beignets. St. Paul’s by-the-Sea invites you to a Scottish celebration of St. Andrew’s Day on November 18th during the 10:00 a.m. service. We will celebrate with dancers, pipes, drums, and Scottish banners. Be sure to wear your family’s (or your adopted) tartan!